Any cancel before one week will be charge for 1st night. After one week. All the room rate will be charge. We re prefer you contact to us to check the avaiable room first before you make the booking. Hanoi Little Town Hotel is in the heart of Hanoi with most popular tourist destination as Night market, Hoan Kiem Lake, Ngoc Son Temple, Hanoi Opera House and the popular Thang Long Water Puppet Show, Night Market on Hang Ngang, Hang Dao Str (every Friday, Saturday and Sunday nights), Ancient House of Hanoi in Ma May street, shopping centers and banking facilities. Hanoi Little Town Hotel is special french style : spacious rooms, offering panoramic views from your balcony, working desk, and comfy beds. 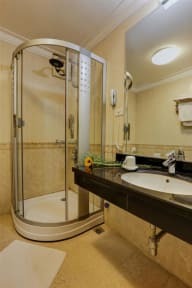 At Hanoi Little Town Hotel we will make sure you get the most out of your stay in Vietnam. Our tours are guaranteed great value; free big breakfast; fruit, tea and coffee available all day, restaurant catering both Vietnamese and Western cuisines, bar, and gift shop for all those Western comforts you miss while traveling. 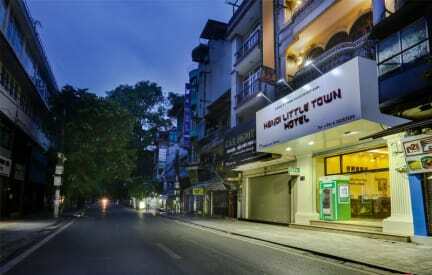 Book with Hanoi Little Town today to guarantee a truly amazing stay in this exciting, vibrant and captivating city. Inspring you alway. Perfect place to get your head down at a reasonable price. Clean. Comfortable. Spacious. Breakfast good. Lovely helpful staff. No complaints! Amazing friendly helpful staff. Best I’ve ever had and I’ve stayed in 5 star hotels over the world. they were going above and beyond to help us. Location is based in old quarter, 5-10 min walk from the busy road everyone goes to. Great spacious rooms, they upgraded us to the best room with a view and a balcony when they saw us smoking to accommodate us. They are amazing, can’t say it enough. If I’m Hanoi I will always stay here. Great hotel. I love this hotel! I came back a few days later and asked t keep my bag there and they were more than happy to and called me a cab! Staff very helpful. Kate went above and beyond for us every day, whether it be booking tours, answering questions or generally talking. She is a credit to the hotel and we would highly recommend staying here for a great experience in a great location. Staff are very friendly and helpful specially Hannah. Spacious room and free breakfast buffet which was also very good. They even arrange us a transfer to the airport at a good price. Highly recommend! We had the cheapest double room and so I think it was noisier than others eg you could hear the lift binging from next door. But ear plugs helped. Great big beds, they had to push our twins together as there was a mix up though. Not as good as a double. Good hot shower but did have a cockroach run out from under the bath! Great breakfast. All in all a good deal for the price.